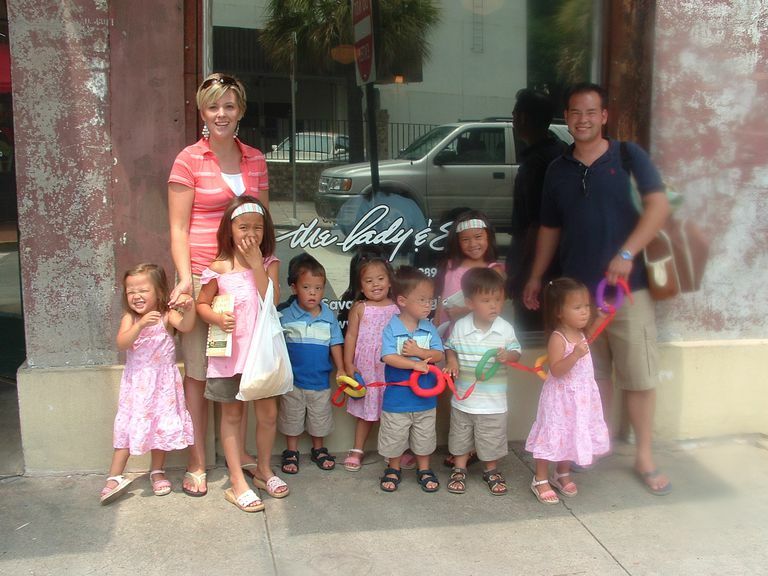 The Gosselin Family: Jon and Kate Plus 8 kids: Twins Cara & Mady, and Sextuplets Aaden, Alexis, Collin, Hannah, Joel and Leah. Photo reprinted with permission of Jon Gosselin. When Kate and Jon Gosselin became the parents of six babies at once it was international news. This was, in part, because sextuplets are extremely rare. In fact, only about 0.00092% of pregnancies result in more than three babies at once. The likelihood of all the babies surviving is also extremely rare. In fact, according to Kate's newest book, very early in the pregnancy there were seven embryos, but one did not develop. Why Are Live Births of Sextuplets More Common Now Than Ever Before? Twins have always been fairly common, particularly fraternal (non-identical) twins. But live births of three or more babies were rare until the last few decades. There are several reasons for this. There are risks related to any kind of multiple pregnancy. Prior to the availability of antibiotics and caesarean births (C-sections), multiple pregnancies often ended in death for both babies and mothers. As parents are choosing to have children later in life, the likelihood of multiple births increases. That is, in part, because changes to the mother's ovulation process result in more instances of multiple eggs per cycle. Infertility treatments including in vitro fertilization are now readily available. In vitro fertilization involves the development of multiple embryos which are implanted into the mother's womb. Not surprisingly, many in vitro pregnancies result in multiple babies. Almost all multiples are born earlier than the usual 37 weeks. This means the babies are unusually small and undeveloped. In the past, such babies could not survive. Modern neonatal and intensive care facilities, however, make it possible for even very tiny, immature babies to survive and even thrive. Kreider met Jon Gosselin at a company picnic on October 5, 1997. They were married on June 12, 1999. On October 8, 2000, she gave birth to twin girls, Cara and Madelyn "Mady", who were, at 35 weeks gestation, five weeks premature. Gosselin became pregnant through fertility treatment because polycystic ovary syndrome left her unable to conceive otherwise. After further treatments, Gosselin became pregnant again, and on May 10, 2004, in Hershey, Pennsylvania, at the Penn State Hershey Medical Center, she gave birth to sextuplets: sons Aaden, Collin, and Joel, and daughters Alexis, Hannah, and Leah. She gave birth at just shy of 30 weeks gestation. The sextuplets were born 10 weeks premature. The early birth required that the six infants be placed on ventilators. The sextuplets were born at 30 weeks, at Penn State Milton S. Hershey Medical Center in Hershey, Pennsylvania. Kate Gosselin remained hospitalized for several weeks before her delivery. Alexis Faith was the first baby born, at 7:51 a.m. She weighed 2 lbs.11.5 oz. Next was Hannah Joy at 2 lbs. 11 oz., then Aaden Jonathan, the smallest baby, weighing 2 lbs. 7.5 oz. Another boy, Collin Thomas, followed weighing 3 lbs. .5oz. and then Leah Hope was born weighing 2 lbs. 14.8oz. Finally, Joel Kevin arrived at 7:54 a.m., weighing 2 lbs. 9.7oz. The Gosselins were already parents to twin girls (Cara Nicole and Madelyn Kate, born in October 2000) when they decided to try for "just one more baby" in 2003. Both the twins and the sextuplets were the result of fertility assistance due to Kate's Polycystic Ovarian Syndrome (PCOS). The family's life has been documented in the popular television series "Jon and Kate Plus 8" which airs on Discovery Health and TLC. The Gosselin's book Multiple Blessings (compare prices) was released in 2008 and describes their story and the faith that sustained them through their journey. In June 2009, Jon and Kate announced that they were filing for divorce.